Director – Gary Winick, Screenplay – Susannah Grant & Karey Kirkpatrick, Based on the Novel by E.B. White, Producer – Jordan Kenner, Photography – Seamus McGarvey, Music – Danny Elfman, Visual Effects Supervisor – John Andrew Berton, Visual Effects – Fuel International (Supervisor – Simon Maddison), Illusion Arts (Supervisors – Syd Dutton & Bill Taylor), Rhythm and Hues (Supervisor – Todd Shifflett), Reel FX Inc, Rising Sun Pictures (Supervisor – John Dietz), Tippett Studio (Supervisor – Joel Friesch), Special Effects Supervisor – Clay Pinney, Creature Effects – The Stan Winston Studio, Production Design – Stuart Wurtzel. Production Company – Paramount/Walden Media/The K Entertainment Company/Niclekodeon Movies/KMP Film Invest GmBh. In Somerset County, Maine, Fern Arable protests at her father’s intention to kill a runty pig. She takes the pig and determines to raise it as her own, naming it Wilbur. She is forced to leave Wilbur in her Uncle Homer’s barn. There Wilbur feels lonely and ignored amongst all the other animals but soon makes a friend in the spider Charlotte. When Wilbur learns that his fate is to end up cooked, he becomes depressed. However, Charlotte comes up with a solution – she weaves a web that has the words ‘Some Pig’ written in it and soon the whole county comes to marvel at Wilbur’s uniqueness. Charlotte’s Web (1952) began as a children’s book by E.B. White. 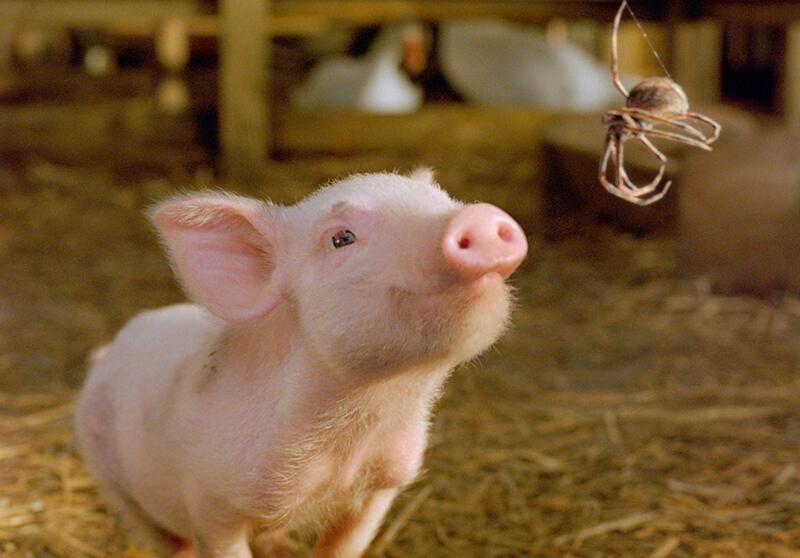 This was made into a charming and delightful animated film, Charlotte’s Web (1973), from Hanna-Barbera. 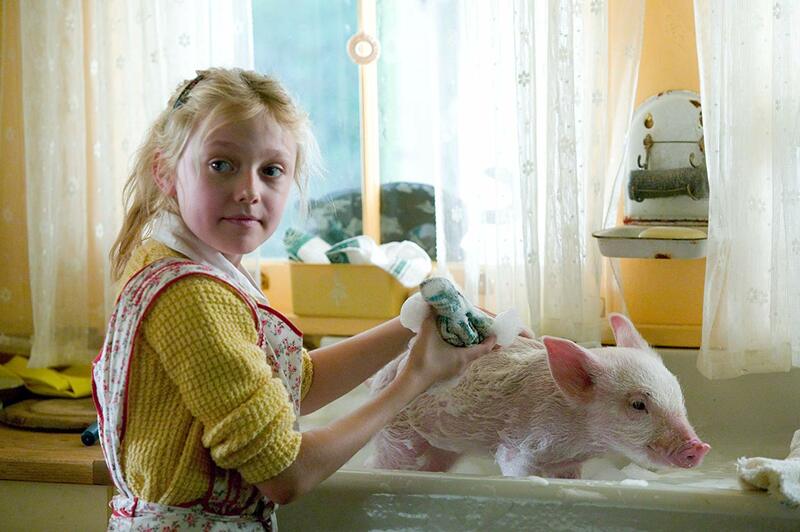 This later gave birth to a direct-to-video sequel, Charlotte’s Web 2: Wilbur’s Great Adventure (2003). And here Charlotte’s Web emerges as a live-action film. The remake has clearly been conceived following the success of Babe (1995), which reinvented the standard talking animals animated film in live-action using a blend of animatronics and CGI. A number of other talking animal classics like 101 Dalmatians (1996), Dr Dolittle (1998), E.B. White’s Stuart Little (1999), Animal Farm (1999), Garfield (2004), Yogi Bear (2010), Paddington (2014), The Jungle Book (2016) and Peter Rabbit (2018) have also received the live-action treatment in the last few years. Alas, Charlotte’s Web 2006 remains only a couple of rungs on the ladder above the inanity of similar talking barnyard animals efforts like Racing Stripes (2005) and its rapping, farting and pooping barnyard animals or the same year’s Barnyard (2006), which featured hip animals driving cars and motorcycles. At least there are no overtly annoying and in-your-face pop culture references here, although we do get farting horses, a hip rat and wisecracking crows who engage in slapstick chases through the dump. All the supporting barnyard animals, which are voiced by names no less impressive than Oprah Winfrey, John Cleese, Steve Buscemi and Robert Redford, are only drawn as simplistic, easy comic caricatures. All considered, Charlotte’s Web at least emerges better than it might have when you contrast it to an embarrassment like Racing Stripes. Charlotte’s Web 1973 worked on its charms. Alas, in the remake, director Gary Winick, who previously made the mawkish feelgood bodyswap film 13 Going on 30 (2004) and went onto the romcom hits Bride Wars (2009) and Letters to Juliet (2010), plays the heartstrings and aims for simplistic awe and wonderment. Winick directs the story in a way that underlines all the obvious cute and mawkish elements. The original felt that its charm came in wholly natural ways; the remake feels like it is standing over its audience with cue cards telling them when to be charmed. Yet, for all that Charlotte’s Web is determined to be wholesome family entertainment, the supporting characters are an unlikeable and pessimistic bunch. One ends up being surprised by their often overwhelming attitude of self-interest rather than community spirit. Instead of doing anything to support the poor, vulnerable Wilbur, he is frequently given advice that tells him to toughen up in a harsh world where he is going to inevitably end up as food on human dinnertables, while every triumph that Charlotte’s webs achieve is quickly greeted with negativity by the other animals. It is surprising to see such an attitude of adult disillusionment and pessimism in a film like this and one questions whether it has a place in a children’s film. There is also the clear influence of Babe on the Charlotte’s Web remake. Wilbur looks and talks so much like Babe that you would not be far wrong in thinking that they had cast the same pig in the role (aside from the fact that Wilbur is played by a combination of animatronics, CGI and 47 different live pigs). If anything, the resemblance shows just how much Babe drew its ideas from the concept of the secret life of barnyard animals from Charlotte’s Web. Certainly, the remake does follow the original film’s story closely. The main point of difference is that Fern is a much more crucial character in this film. In the original, she is a more distant figure who abandons Wilbur after she starts to grow up and spends time with a boy she met at the County Fair. There is a boy here but Fern stays with Wilbur through to the end of the film. Charlotte’s Web 2006 comes from Walden Media, the production company owned by Christian billionaire Philip Anschutz that has been set up to make family and often Christian-themed movies. Walden Media were also responsible for I Am David (2003), The Chronicles of Narnia: The Lion, the Witch and the Wardrobe (2005) and Amazing Grace (2006). Walden Media have subsequently been trying to corner the market in family friendly films with the likes of Bridge to Terabithia (2007), Mr Magorium’s Wonder Emporium (2007), The Seeker: The Dark is Rising (2007), The Water Horse (2007), City of Ember (2008), Journey to the Center of the Earth 3D (2008), Nim’s Island (2008), Tooth Fairy (2010), The Giver (2014), A Dog’s Purpose (2017) and The Star (2017). There are a number of subtle additions to the Charlotte’s Web story that come in between the 1973 version and the remake that show up Walden Media’s desire to push Christian values on mainstream audiences. For one, there is the advertising campaign the film went out with – a poster with the legend “Help is coming from above.” Beau Bridges’ doctor gives Dakota Fanning’s mother speeches about how a child’s belief in invisible things is a good thing. Even more so, the film emphasises the amazement of ordinary miracles – Charlotte’s ability to spin a web is seen as evidence of the miraculous in the everyday. None of these elements exist in the original version. In many ways, the Charlotte’s Web remake reminds of the remake of Miracle on 34th Street (1994) where the original’s charms were subtly spun so as to reflect more conservative (Christian) Family Values.